Bright and citrusy, oranges are juicy fruits we all love to binge on. The fruit that is available from November through January as well as in the summer months of March to May, is enjoyed around the world in numerous ways. The versatility of oranges is evident from the fact that you can eat it in a range of ways, from consuming it raw or juicing it, to including it in cakes, cupcakes, pastries, salads, mousses, etc. Whether you love to toss them in along with some greens, or down a glass of fresh juice at breakfast in the morning, oranges are simply delicious. But, that’s not the only reasons they are one of the most favoured fruits around the globe. Oranges are chock-full of nutrients, the most prominent one is vitamin C, which is great for skin. Oranges are also great for the immune system, keep blood sugar levels and blood pressure in check and also may help control cholesterol. While the benefits of the fruit maybe well known, not many people know the benefits of the peels of the fruit. Did you know that orange rind may help you lose weight? There are more reasons than one to not throw away those orange peels, because they have a number of health benefits. Orange peel powder is widely used in beauty treatments and as an ingredient in face packs. Orange peels have certain characteristics, which make them ideal for weight loss. 1. Full of fibre: Fruit peels are rich in fibre, which makes them a great supplement for the ones looking to lose weight. Fibre is important for satiety and also a good digestive system. 2. 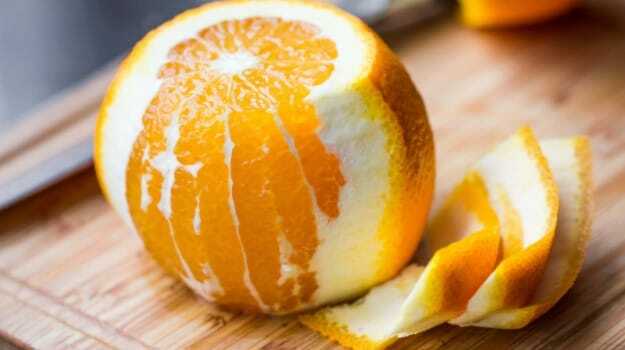 Promotes fat burn: Orange peels, just like the pulp, are rich in vitamin C, which may promote fat burn. Research has also found that orange peel extracts have anti-obesity properties. 3. Fights inflammation and allergies: Orange peels may inhibit the release of histamine, which causes allergic reactions in the body. They also have anti-inflammatory action, due to the presence of flavonoid compounds. Orange Peels For Weight Loss: Orange skin improves metabolism and digestion. 4. Fights constipation: Orange peels contain non-soluble polysaccharides like pectin, which prevent constipation and improve health of the digestive system. They also fight acidity and heart burn. A healthy digestive system has been linked to quicker, more effective weight loss. 5. 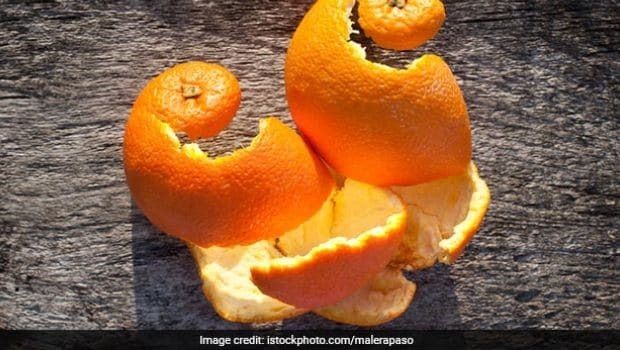 Regulates blood sugar levels: Orange peels may help prevent sudden spikes or fall in your levels of blood sugar, which is credited to the presence of pectin. There are a number of ways you can consume orange peels. One of the best ways to aide weight loss by using orange peels is making a herbal tea out of them. All you need to make this tea is orange peels and water. You can either use fresh orange peels or dried orange peels to make your tea. You can choose to either chop the dried peels or grind them to make a fine powder (if you don’t mind the bitter taste of the orange peels). Add one teaspoon of chopped or ground orange peels to some water over a flame and let it brew for some time. Once the water comes to a boil, turn the flame off, cover the utensil and let the peels steep for about 10 minutes. Filter or strain the water into a cup and your orange peel tea is ready! You can add spices like cinnamon or sweeteners like honey to your orange weight loss tea to enhance its taste. Make sure you wash the orange peels thoroughly before you use them to make the tea. You may even make this tea in bulk and refrigerate it for use over two days. Orange peel rind may also be added to yogurt for flavouring and nutrition or sprinkled over salads. You may also add orange peel powder to your smoothies and milkshakes. Similarly, you can mix orange peel powder with powdered sugar and sprinkle it over home-baked cookies, biscuits, tarts, etc.